Naturalizer Canada is having their one day offer right now! 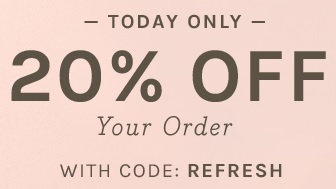 Save 20% on your online order. Everything you have to do is to enter the promo code REFRESH at checkout to receive the offer. Offer is valid on all styles. Official source of the information is Naturalizer Canada. Offer expires today (03/21/2016)! For more information about the promotion visit Naturalizer Canada website.